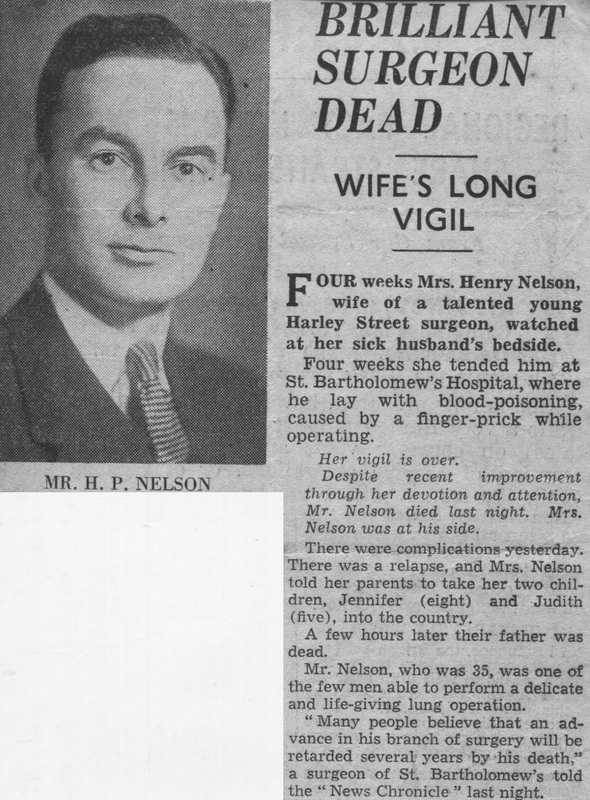 FOUR weeks Mrs. Henry Nelson, wife of a talented young Harley Street surgeon, watched at her sick husband’s bedside. Four weeks she tended him at St. Bartholomew’s Hospital, where he lay with blood-poisoning, caused by a ﬁnger-prick while operating. Despite recent improvement through her devotion and attention, Mr. Nelson died last night. Mrs. Nelson was at his side. There were complications yesterday. There was a relapse, and Mrs. Nelson told her parents to take her two children, Jennifer (eight) and Judith (ﬁve), into the country. A few hours later their father was dead. Mr. Nelson, who was 35, was one of the few men able to perform a delicate and life-giving lung operation. “Many people believe that an advance in his branch of surgery will be retarded several years by his death”, a surgeon of St. Bartholomew’s told the “News Chronicle” last night.